My daughter was home on Friday with a fever and cold. I decided to make her a little get well juice of oranges, carrots and ginger. I swear she was feeling much better the next day. So on Saturday, we got our co-op basket and it was packed with fruit, so I decided to make her another juice. Both my girls drank this up. This is full of good stuff. Ginger is anti-inflammatory, a pain fighter and can help with nausea. Oranges can protect against heart disease, purify blood and keep your bones and teeth strong. Carrots can improve vision, prevent cancer and are anti-aging. Honeydew melon’s are anti-aging and rich in B vitamins which can help with immunity. Pears contain a good amount of B vitamins as well. Lemons can also boost immunity. So I thought this juice would do her some good. If you are wondering what kind of juicer I have, you can see it here . Juice all the ingredients in the order they are listed. If you want to add some greens, feel free. I have not been able to get my daughter to drink the green juice yet. I will keep trying though! 🙂 Try to drink your juice within the first 12-24 hours to get the most benefits. If you go longer, some of the enzymes may be lost. I got about 25oz of juice out of this recipe. Enjoy! My son and daughter both love the green juices...I wanted to recommend (if you aren't anti-plastic) to try putting the green juice in a colored cup with a lid-as well as a colored straw...My son was reluctant when we first started juicing but after trying it in his blue cup he could care less what color it was after...luckily we started them young! Awesome recipe though! Good idea. I also freeze green smoothies and juice and then put them in pop molds. They don't seem to care that way either. This looks great! Can I also make some sort of smoothie with my food processor out of this, as I don't have a juicer? I just bought a food processor and don't feel like buying another expensive appliance right away ;) Thanks! I haven't tried this in a food processor, but you can mix it in the blender and then strain. That will work. I like a strong kick of ginger. About 1 inch. If you want it with less of a kick, you can do 1/2 inch. Can I use my nutribullet for this recipe and it taste and do the same thing? I'm not sure what a nutribullet is, but if it blends, yes you probably can. Nothing beats a kick of ginger when feeling under the weather! I have boys so getting them to drink green juice was as easy as calling them Incredible Hulk shakes! No need for a juicer!...I just put this in my vitamix! I didn't even strain it, just watered it down with coconut water. It was delicious! Peaches are out of season, so I subbed papaya (extra vitamin C) and I left out the celery since I was using my blender and feared the kids wouldn't like the strands. I'm not a ginger fan, but I really liked it in this drink. So much left over that I made 8 Popsicles too...hopefully it helps my little one who is trying to fight something off. Just found Melissa's website. Love it! I also have a Vitamix, so your information is awesome! What I have been doing is buying Dole frozen fruit. They are flash frozen, so I can have a wide variety of fresh fruit in my smoothies all the time. :-) I started out with a little ginger, but, as time passed I started wanting more. I now love ginger, especially with cilantro in my drinks. Melissa has so many great ideas and her journey into vegan sounds so similar to mine! :-) Thanks for sharing your comment. How come I can;t PIN the juices! I want to save this for later! Looks so good. To get my kids to drink juice I usually juice whatever I want them to drink (kale, celery, etc) then throw it in a blender with a banana and strawberries. They always drink it right up!! I make popsicles. I am convinced they can't turn anything down in popsicle form. lol. Haha! You are probably right. I'm a bit late to the party here, but I just wanted to say what a tasty looking juice recipe! I like how you mentioned to drink the juice as quick as possible before some of the enzymes are lost. Among all of the health benefits of fresh juices, many people forget all of those awesome enzymes! I have never as of yet juiced a nectarine, and you've inspired me to keep my eyes open for these so I can give it a try! 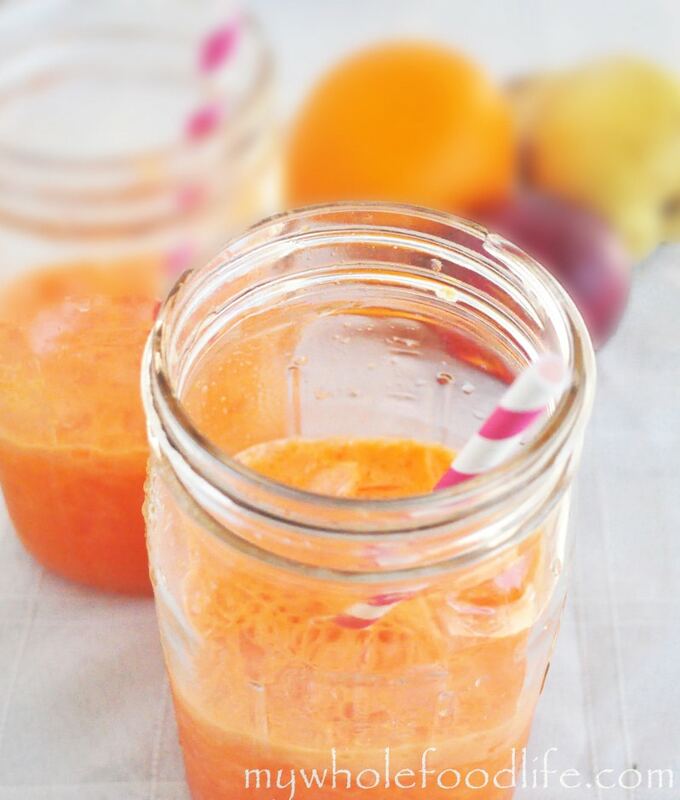 Great juice recipe! Are you using the rinds of the lemon and orange or the fruit itself? No rinds. I tried once and they are too bitter. I peel the fruit for this. I do save the rinds in the freezer for recipes that call for zest. Any tricks for peeling lemons? I always seem to make a mess with this! I use a knife to cut away the peel. Melissa, thank you for your website! I just found it this morning and am really enjoying every aspect of it! I have a juicer, but, have not used it yet. I am using my Vitamix blender for my smoothies. Your decision to transition to a whole food life style is so similar to mine. My kids are grown now and I look back and shudder when i think what we ate. lol fast food, proccessed foods, junk foods. Back then, our "staple" raw foods were baby carrots, raw broccoli, and green beans. Fruits were OJ in a bottle, strawberries, blue berries and bananas. We ate dairy like it was going out of style - cheese, cow milk, and yogurt. Everyone always seemed sick with allergies. My kids are grown up now and I am slowly but surely getting them to make healthier choices. At 59 (which is my current age), my dad died of a massive heart attack and my mom has Alzheimer's disease. I decided I needed to make changes in my diet that could prevent, or at least offset the chances of my (or my kids) suffering from illnesses. I watched the movie "Fat, Sick and Nearly Dead" and was hooked on learning more and making healthier choices. I am working on totally eliminating processed sugar and gluten. I have totally eliminated dairy and just that alone made me feel a thousand times better! Do you have a link about gluten? I get confused about whether whole grains are gluten or not. Thanks! Hi Cindy! Glad you found me! I am sorry to hear about your parents. :( I don't have a link for gluten, but I do avoid it. My husband has back pains and eliminating gluten has relieved a lot of them. Some whole grains do contain gluten. I would avoid whole wheat if I were you. Spelt also contains gluten, but much less. I personally like to use gluten free oat flour in my baking. I hope that helps! Is this juice for one person?